A new series? Maybe. 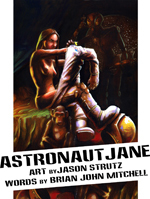 Astronaut Jane is about an astronaut alone in space. This piece was written based on the cover art - which is an interesting way to work.